In the days before men and women cohabited pre-marriage, it was often said that if a man saw what went on, as the bride and her entourage of bridesmaids, mother, aunts and grannies got ready for the wedding, even a strong man would run screaming into the nearest monastery. Indeed, any man who has overlooked the old saying “As a girl grows into a woman, so that woman will grow into her mother”, will ponder his foolishness all too late! I am most fortunate in that, while she was alive, I got on really well with my mother-in-law, and vice versa, apart from rare case of raw fear exhibited by my husband at their first meeting, he got on extremely well with mine. But weddings are a hugely stressful time, and these days ludicrously expensive, often costing half a year’s salary for the bride or groom which, traditionally, would have been paid by the bride’s father, but not these days. Added to the self-imposed stress of looking one’s best, comes the lifelong debt, the impossible repayments and the impossible in-laws! 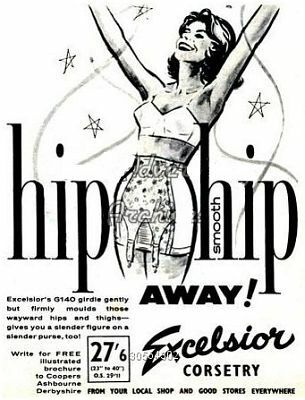 "Hip, hip away" might sound corny, but hips feature strongly in the psyche of most women. The modern lady on the right is going to need something far stronger than a mere shaper to make her hips go away. 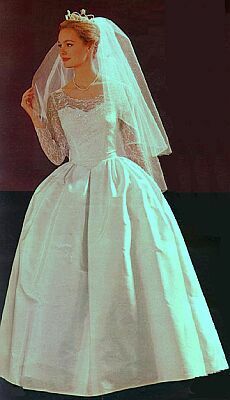 I once attended a cousin’s wedding in the late 1960’s, and this was not just any cousin, this was the only child of an intensely proud, by no means wealthy couple, and, just to add spice to the occasion, the girl was a red-head. I would have killed for her hair, but not her temper that was waspish on a good day, and close to hysterical as the wedding day approached. Beneath the crinolines and petticoats that support this charming outfit (right - Montgomery Ward 1964, and it could have been my cousin), anything is possible. All that is required here in the case of foundations is a quality strapless brassiere, and, perhaps, the waist-nipper beloved by Spirella for its weddings. The charming lady on the left, could well have been the mother of my friend, and, the prospective husband could easily have deduced the size of his fiancée's hips from her mother's own. The lady was known well to my mother and fought a life-long battle with her hips, armed with the most expensive girdles and latterly corsets that her husband would allow. 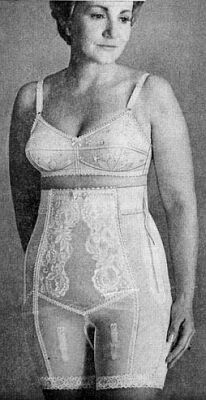 By no means un-shapely, and actually a very elegant woman, my mother swore that it took a heroic effort on the part of Gossard for her to fit into her rayon twin-set. As we have expounded elsewhere, a foundation garment can only rearrange flesh, it cannot compress it, for if it does at one point, it will re-emerge at another. Girdles from the 1950's (left ), through the 1960's and 1970's, and onto recent times (right). The body’s skeleton sets an absolute limit to the extremes of corsetry or weight-loss that seems more fashionable these days! Wide hips cannot be reduced further than the pelvis, although the overlying flesh can be moulded and disguised, and indeed, this is what my attractive red-haired friend achieved with the help of her girdle and the loose drape of her skirts. 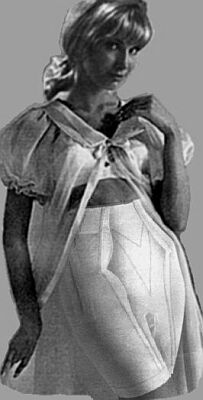 I recount this tale for my husband remarked on a series of advertisements that quite candidly show attractive women modelling girdles, and no amount of artistry and coyly folded negligees can hide the fact that these women simply have big hips. It may even be that the size of the hips is even emphasised by the girdles! The expressions of the models vary widely from Spanish embarrassment (to the extent that she hides her face), through coy acceptance of this physical defect to the modern amazon who frankly dares one to comment.